This model was introduced shortly following Exhibit’s Iron Claw series of diggers in the early 1930’s, and the Art Deco style was quite ‘modern’ compared to the Victorian style of the Iron Claws. There were a number of different trim castings used for the front face and delivery chute of the Novelty Merchantman series. This one features script lettering and a pull-down door. The theme of a merchantman steam ship at dock side in the south pacific gives the Merchantman models a wonderful display appearance. Each background was hand painted on paper and, of course, most of them have deteriorated over time. The wood work is walnut and birch for a dramatic contrast creating the deco style. There was also painted trim around the upper front door and down the front corners on some pieces. 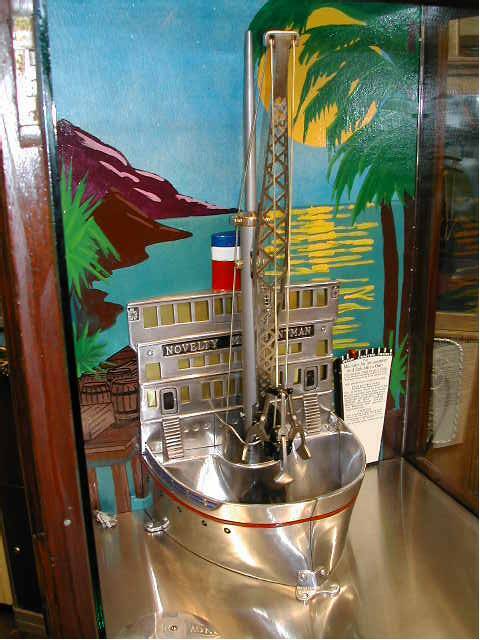 This Novelty Merchantman was been carefully restored to perfect original and is now in a private collection in California.